Before you can conserve something, you have to know what it is called. I don’t know who first said that famous phrase, it may have been in common use for hundreds of years, but it certainly holds true for the hidden world of freshwater ecosystems. Beneath the surface of the rivers of India’s sub-continent there are many things still to be understood, so if we are to protect them, then we need to understand their value, and that starts by first knowing what they are. My first ever visit to Nepal was essential for me to get to grips with learning some of the subtle differences between the land-locked country and its massive brotherly neighbour, India, where I have spent 20 years helping to fight against the devastation of river habitats. It was quite striking to see that India is putting enormous pressure on Nepal to control the flow of the rivers before they cross the southern borders. For India, this involves moderating flows so that the show-piece Ganga river navigation scheme can be a success; for Nepal, building dams is said to be to allow ready access to cheap power, which will enable development and income. During a number of meetings, in Kathmandu and Pokhara, with a cross-section of concerned river users and also those who are involved in working on river development schemes, there was broad consensus that poorer areas of the country needed access to power, but that there are more sustainable ways of achieving this than simply putting huge dams across every river. Judging by some of the responses I got, and some of the reports I read, there is little public understanding or reporting of the fact that many of the proposed hydropower schemes are already set to be ‘white elephants’. The economic rational seems based on India buying surplus power at inflated prices, when India (which already generates surplus capacity) would be losing sales to Nepal and thus have more power than it needs or can use. There have been reports in some areas of the press about the environmental impacts of the dam building programme, but as is often the case when large multi-national companies are trying to encourage dam building, correct and thorough Environmental Impact Assessments are low down the list of priorities. In a letter to the Himalayan Times, I gave my response to an excellent article by Hari Krishna Shrestha ¹, in which I explained about how important a full understanding of e-flows is when trying to assess the environmental impact upon a whole river basin, not simply the command area. E-flows have to be recorded over years and during many different seasons to have any chance of being effective. And then, when they are built into an operating programme for a dam, it has to be understood that they are a minimum requirement, not part of a wish list. In a short meeting held in Kathmandu, at the Central Zoo ², we all agreed that ensuring the viability of habitat is essential for all, no matter what the specialist interest. This concern for habitat protection connects all those who value the riches that nature offer to mankind and extends across natural and political boundaries. Freshwater habitat is one of the most vulnerable spaces on the planet, yet we and future generations are so dependent upon the bounty it brings. Following the devastating earthquake of 2015, there is a huge and ongoing rebuilding campaign in Nepal. Unfortunately, even the government programme to allow individuals to reconstruct their own houses is beset with delays and problems of communication. Quite rightly, allowing people to find adequate shelter is a huge priority as another monsoon season looms. Concern about where the building supplies come from, how much of the natural environment is ruined, and whether or not the massive removal of river aggregates is being done under the cover of a building programme that quite clearly is not what it should be are questions that need to be answered urgently. Sand and gravel mining is a huge and very often illegal industry common to both India and Nepal. There have been many instances of Mafia figures intimidating local communities and resorting to killing journalists and even police ³ who threaten to expose them. My advice to all those who are threatened by those involved with the removal of river substrate, or those in both countries who want to oppose this pernicious industry, is to make local communities aware of the dangers they are unleashing. Those precious sands and gravels ensure river flow is moderated and that groundwater recharge continues. Removal means the river will be faster, more powerful, and hence more dangerous when in flood. It also means there will be less of the life-giving water locked into the earth for slow release once the rains are over. So although the conservationists among us are desperately keen to stop the removal of habitat, whether spawning gravels for fish, or fertilising silt deposited on river bends to create new vegetation for nesting birds, there are also direct human consequences. We should be ever more connected, both inter-disciplinary and cross-boundary to take forward this fight against those who have only instant profit in their minds, those with no concern for the wider impacts and who are indifferent to the needless deaths and destruction they wreak. I was very lucky to find that there are lots of concerned people, across a wide range of disciplines, who have the country’s rivers at heart. Not only fish scientists, but also those working on water birds, insects, amphibians, to pollution and river flows, and also flowers and trees. All have a role to play in ensuring river ecosystems can withstand the challenges of providing the benefits humans need while also sustaining a diversity of life. But the challenges are many and varied and it will take long struggle to ensure these vital lifelines are not bottled up for the benefit and enrichment of a privileged few. It was unfortunate for me that Megh Ale ⁴ was not available for my meeting. However, we have agreed through email contact and following on from previous meetings between Nepal’s ‘River Man’ and Mahseer Trust Chair, Ian Pett, that the River Karnali, Nepal’s longest river, has to be protected. It can be viewed as a natural treasure on an equal footing with the majesty of the Himalayan peaks, with mysteries below its waters that even now require patient study to even begin to grasp their value to the people who live alongside. Here too, there is a hidden story about human suffering that should cause those who are prepared to cut off a large part of the river to stop and think about the ramifications. 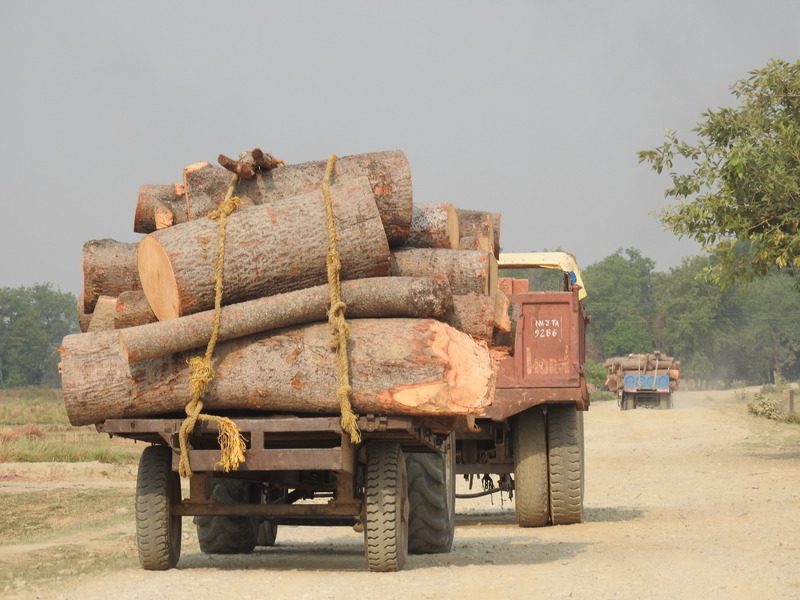 The Nepali Times reported ⁵ on the four-year drought that has been responsible for such a loss of food production that the inhabitants are no longer able to store seed for the next growing period. This drought is blamed on the depletion of the water table, in an area fed by two rivers under threat of damming: the Mahakali and the Karnali. Once again, catastrophic impact on humans is as much a concern as changes to the environment and the result for wildlife. This shows very clearly that people are and should always be seen as, integral parts of the environment, not only because of our use of ecosystem services, but also how vulnerable we are to their loss. The completion of a comprehensive EIA on the Karnali dam site is only the first step. Negotiations between Mahseer Trust, Megh Ale and Bhaskar Karki of International Centre for Integrated Mountain Development (ICIMOD) should lead to a major review of the whole river and its associated biodiversity over the next year. Fish are ‘my thing’ and although I am firmly of the opinion that all those who benefit or are impacted by river habitats have a need to work together, still, fish are my primary concern. 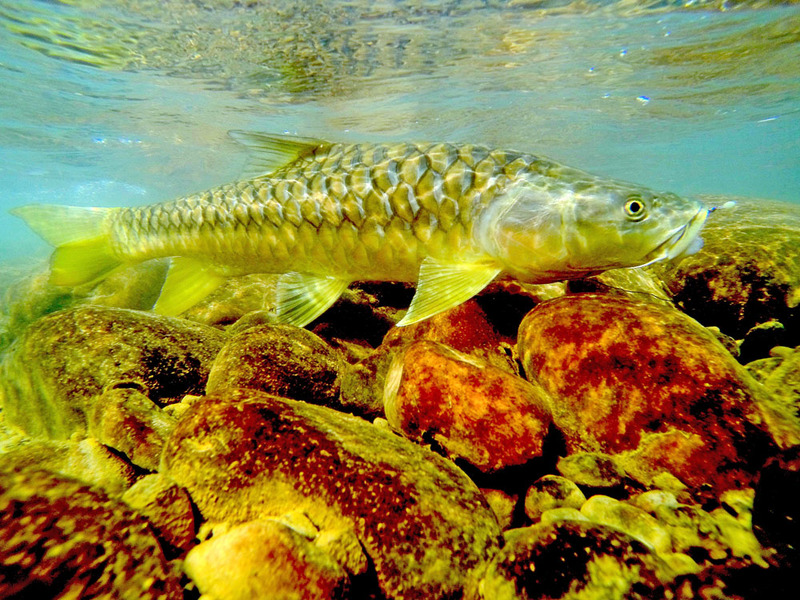 In particular, my focus is on mahseer, a large, omnivorous member of the carp family. These beautiful creatures live in well-oxygenated, fast flowing rivers, and are perfect bio-indicators. Currently, in Nepal, there is only one species of mahseer that is correctly documented and fairly well understood: Tor putitora, the golden mahseer. However, it is pretty certain that two more species are present in Nepal’s rushing rivers: Tor tor and Tor mosal, although neither species can, currently, be identified with any certainty, due to sketchy initial descriptions and decades of ignorance pedalled as scientific truths. Add to this mix that there may well be other species, as yet undescribed, and my opening remarks leave not only mahseer, but also many other less visible fish species facing uncertain futures. Untangling the status of T. tor and T. mosal ⁶ has to be the first step in any river conservation plan that involves fish. If there is a young scientist in Nepal who is interested in and has some experience of handling fish, then I would love to hear from you. A plan is in place to carry out a project, and I can help to find the funding needed to enable a robust and long-term field study for the right person. Simply drop me an email to: steve@mahseertrust.org with a short introduction note and I will help to put together a team to help establish, once and for all, some of the mystery of Nepal’s major river fish. Once we know what it is, we can begin positive plans to protect it, and that will bring benefits for all those who depend upon Nepal’s beautiful rivers. Steve Lockett is the Education and Outreach Officer for the Mahseer Trust, a UK-based NGO who use scientific research into the fishes of the Tor genus and the ecosystems in which they live to shape conservation and education agendas for river habitats and those who depend upon them. The Mahseer Trust uses the tagline: rivers – fish – people. They estimate that almost half of the population of India has a close dependence upon a river ecosystem, before water supplies to cities are taken into account.